At present, Nor and I are enjoying a couple of days in the hippy Mecca of the southwestern United Kingdom. I refer of course to Glastonbury, with its mysterious tor rising in the mists of Avalon, its purveyors of superstitious nick-nacks and its many occult bookshops none of which have an adequate (or existent for that matter) computer science section. 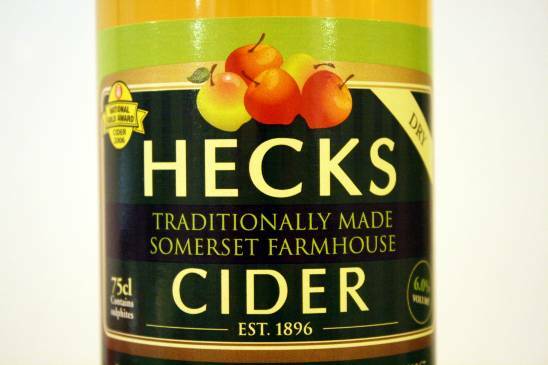 To judge from their very nineties-style website, Hecks are a cidermakers rooted in tradition. I have only tried it from the box in the past. This time I was drinking the dry variety, and from a 750ml bottle. The colour is a lovely pale orange clearly visible through the clear glass bottle. There is just the merest hint of fizz on undoing the plastic screwcap. The cider pours smoothly and with no discernable fizz. I drank mine from a wine glass for some unfathomable reason. The taste is phenomenal, it is light and smooth with tonnes of caramel and vanilla flavours, maybe they are using sherry casks to age it in or something. There is a bit of muscularity behind the smooth, creamy flavour though, at six percent ABV, Hecks is by no means the strongest cider out there. After all the creamy smoothness, the aftertaste has a tannin kick that nicely rounds out the experience. Hecks dry is not the dryest farmhouse cider out there, not is it the strongest. But it is certainly among the smoothest and one which I can recommend enjoying frequently and with great intensity.